MEGGLE are specialists in processing lactose to produce pharmaceutical excipients (substances other than the active ingredient to be included in a drug delivery system). The purpose of the excipient is to aid processing during manufacture, enhance stability or bioavailability, assist product identification or in some other way enhance overall safety and effectiveness of the product in storage or use. 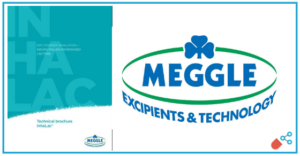 The wide range of MEGGLE excipients include co-processed excipients that are innovative, superior products exhibiting unique functional characteristics that cannot achieved through simple blending. This means that co-processed excipients have functionalities that are not achievable through mere sample blending. The pharmaceutical industry first started to use co-processed excipients from the late 1980s, with early examples including co-processed microcrystalline cellulose and calcium carbonate, introduced in 1988, MEGGLE’s co-processed cellulose and lactose (1990), and co-processed glucomannan and galactomannan (1996). In all co-processed excipients, the combination of ingredients is designed to maximize performance and functionality. Co-processed excipients can be produced using a variety of processes that include dispersion with high shear mixer, co-milling, homogenization, co-precipitation, co-crystallization, wet granulation, extrusion or hot melt extrusion and spray-drying. 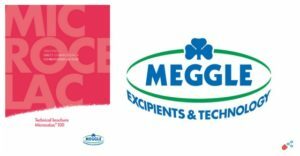 MEGGLE offers five principal brands of co-processed excipients intended for direct compression (DC) tableting applications. All combine ingredients that are recognized under international pharmacopeias and well-established for use in the pharmaceutical industry. The MEGGLE Cellactose® range combines 75% alpha-lactose monohydrate with 25% cellulose powder as functional excipients for oral solid dosage forms, using co-spray drying to integrate the ingredients into a monoparticulate structure with narrow particle size distribution (PSD), while retaining their individual chemical identities. This creates synergistic functional performance advantages, principally improved compactibility, flowability, mixing characteristics and increased adherence capacity, which reduces the segregation tendencies typical of simple powder blends. 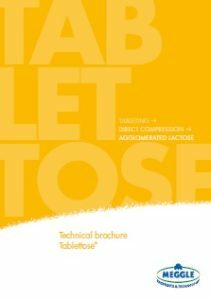 Cellactose® 80 was developed to offer the compaction and flow properties necessary for DC tableting, where its superior compaction properties increases tablet hardness in high dose and low-dose formulations. Cellactose® 80 may also be used in other formulation applications such as dry granulation and capsule filling. 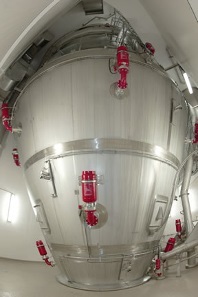 MicroceLac® 100 uses co-spray drying to combine 75 % alpha-lactose monohydrate and 25 % microcrystalline cellulose (MCC) into a monoparticulate system having brittle fracture and plastic deformation compaction mechanisms, with individual particles that retain their distinctive chemical identities. MicroceLac® 100 maximizes formulation development flexibility, providing the compaction and flow properties desired for DC tableting that may also be applied to other formulation development approaches such as dry granulation and capsule filling. Its enhanced compaction and superior flowability improve blending and mitigate API content variability typical of simple powder blends. 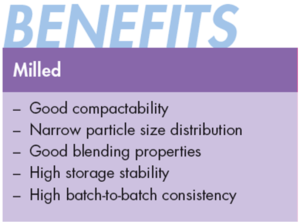 These superior blending characteristics make it ideal for API content uniformity critical low-dose formulations, while its compaction properties help increase tablet hardness, making it well-suited for high-dose formulations as well. StarLac® combines 85 % alpha-lactose monohydrate and 15 % maize starch (corn starch) as functional excipients used in oral solid dosage forms. To establish synergistic functional performance, such as enhanced compactibility and faster tablet disintegration, lactose and starch are co-spray-dried to form a monoparticulate system. StarLac® provides compaction and lubricant insensitivity characteristics desired for DC, and the hydration properties desired for rapid API release. Additionally, StarLac®’s flowability is superior compared to a physical blend of the individual components in equivalent ratio. This makes it an ideal co-processed excipient for DC tableting that can also be used across a range of dry granulation formulations. High-functionality CombiLac® is an integrated, co-processed ready-to-use excipient, specifically designed to ease oral solid dosage form development and manufacture by combining 70 % alpha-lactose monohydrate, 20 % microcrystalline cellulose (MCC) and 10 % white, native corn starch into a monoparticulate structure that is not separable by physical means. It is the co-processed excipient of choice for applications where robust, time saving development of frequently used formulation ingredients is the top priority, since the ternary combination reduces requirement for raw material testing during production. CombiLac® shows improved compaction properties compared to an equivalent admixture of individual ingredients, providing robust tablets with minimal friability and assuring rapid, hardness independent tablet disintegration for effective API release. It features the powder flow characteristics necessary to enhance dosage form weight uniformity and throughput in DC but may also be used in other formulation development approaches, such as dry granulation. In comparison to a physical admixture of individual components, CombiLac® provides enhanced compaction properties, as well as the flow performance necessary for increased production rates and decreased weight variation. RetaLac® is the first hypromellose/lactose-based, co-processed excipient specifically designed for DC and dry granulation of modified release formulations. RetaLac® is binary in composition but monoparticulate in structure, having hypromellose and lactose in each particle. It is characterized by superior functional performance such as improved flow and blendability. Additionally, the monoparticulate structure, gives RetaLac® both plastic and brittle fracture deformation characteristics, enhancing compactibility in DC compared to traditional wet granulated and physical admixtures of the parent ingredients. API release is controlled predominately by diffusion through the hydrophilic matrix, and is most robust in the range of pH 1 to 7.4. For example, with Vitamin C in a sustained release formulation, use of RetaLac® makes it possible to achieve a simplified sustained release of Vitamin C in excess of 80 % after eight hours using DC, where compaction force of 200 MPa resulted in a tablet hardness of approximately 100 N with a corresponding friability of 0.5 %. To minimize development time, it is possible to predict API dissolution as a function of tablet geometry, aided by RetaLac®’s dramatic improvement in wettability compared to hydroxypropyl methylcellulose (HPMC) alone or traditional wet granulations and simple admixtures. Click on Cellactose® 80 to download product information. Click on MicroceLac® 100 to download product information. Click on StarLac® to download product information. Click on CombiLac® to download product information. Click on RetaLac® to download product information. Wet granulation is a subset of the overall granulation process of size enlargement by combining mixtures of fine powders into larger agglomerates or granules. The wet granulation process adds a liquid solvent and a binder material to an agitated powder bed to form granules. 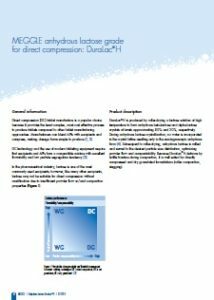 While Direct Compression (DC) is the usual method of tablet manufacture, it may not be appropriate for some active substances, leaving wet granulation as the preferred alternative. 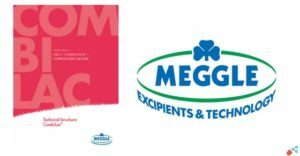 MEGGLE offers excipients that can optimize wet granulation and also provide direct compression alternatives. In the traditional wet granulation method, a moistened mass is sieved to produce wet granules that are subsequently dried, with a subsequent screening stage to eliminate agglomerates. Wet granulation using organic solvents is preferred for water-sensitive drugs, as an alternative to dry granulation, or when rapid drying is required. 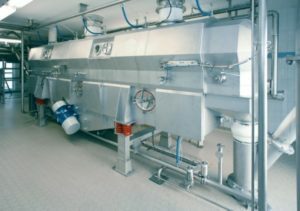 The pharmaceutical industry depends on several types of wet granulation equipment , principally fluid bed granulators where air is blown upwards through the powder to agitate and fluidize the particles or mixer granulators that agitate the powder using a large impeller in mixer bowl. As with dry granulation and DC, wet granulation requires manufacturers to blend APIs with appropriate excipients. 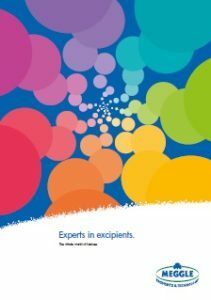 Lactose is among the most frequently used excipients for granulation in pharma applications, offering good compression and blending properties. However, like many other excipients, unmodified lactose may not be suitable for direct compression due to insufficient flowability and compactability. As Figure 1 illustrates, lactose-based excipients meet the needs of wet granulation where compressibility is low but where powder flows are highly variable. Numerous global and regional pharmaceutical manufacturers have historically relied on MEGGLE milled alpha-lactose monohydrate grades as diluents in dry and wet granulation processes, due to their chemical and physical stability, in oral, parenteral and inhalative pharmaceutical applications, versatile binder-filler properties, and global availability. Milled GranuLac® and SorboLac® have a small particle size and support a wide range of applications including, wet granulation, dry compression, premixes, triturations, fermentation and flavor off-set. The range includes GranuLac® 70, GranuLac® 140, GranuLac® 200, GranuLac® 230 and SorboLac® 400. During the milling process, finer, sharper-edged particles are formed, having cohesive powder properties that can be beneficial during granulation processes. Clean unlubricated surfaces created during the compaction process as a result of brittle fracture lead to improved compactability. Alpha-lactose monohydrate and maize starch (corn starch) are functional excipients used in oral solid dosage forms. Both are naturally derived and well established in the pharmaceutical industry. 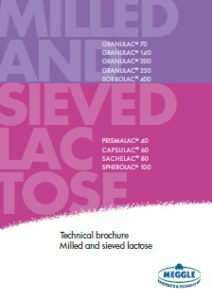 Lactose is frequently used as a diluent or wet granulation binder. Starch can be used as a binder for wet or dry applications, disintegrant, and diluent. In an effort to establish synergistic functional performance, such as enhanced compactability and faster tablet disintegration, lactose and starch were co-spray-dried to form a monoparticulate system. StarLac® comprises 85 % alpha-lactose monohydrate and 15 % native maize starch. StarLac® provides compaction and lubricant insensitivity characteristics desired for wet granulation, along with the hydration properties desired for rapid API release. Additionally, StarLac®’s flowability is superior compared to a physical blend of the individual components in equivalent ratio. These and other properties, such as excellent compactability, rapid hardness-independent tablet disintegration and compaction and hydration properties independent of hydrophobic lubricant type or level, also make Starlac useful for dry granulation and ODT formulations. RetaLac® is the first hypromellose/lactose-based, co-processed excipient specifically designed for DC and dry granulation of modified release formulations. Although hypromellose offers broad flexibility in tailoring API release due to differing substitution levels and molecular weights, processability has generally been limited to traditional labour, time, and energy intensive wet granulation manufacturing methods. Recently, through a proprietary agglomeration process, MEGGLE has succeeded in producing RetaLac® as a co-processed composition comprising hypromellose and lactose, offering suitable alternatives to overcome these limitations. Possessing enhanced functional performance, the new excipient offers characteristics desired in formulation development and manufacture and may be of significant interest to innovator and generic pharmaceutical companies. RetaLac® is binary in composition but monoparticulate in structure, having hypromellose and lactose in each particle. It is characterized by superior functional performance such as improved flow and blendability. Additionally, the monoparticulate structure gives RetaLac® both plastic and brittle fracture deformation characteristics, enhancing compactability in DC compared to traditional wet granulated and physical admixtures of the parent ingredients. API release is controlled predominately by diffusion through the hydrophilic matrix, and is most robust in the range of pH 1 to 7.4. To minimize development time, API dissolution prediction as a function of tablet geometry is possible. This is aided by RetaLac®’s dramatic improvement in wettability compared to HPMC alone or in traditional wet granulations and simple admixtures. 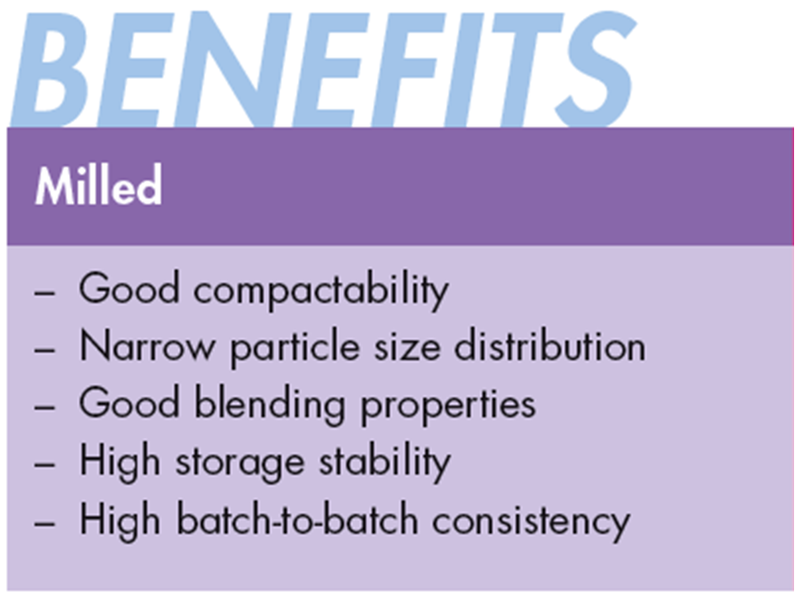 In processability, RetaLac® shows superior performance to physical admixture and wet granulated formulation. 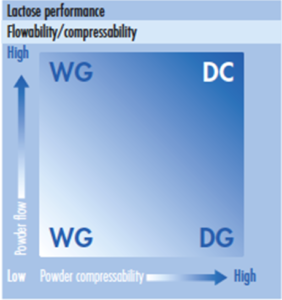 Figure 1: Basic lactose performance matrix of powder blend compressibility and flowability requirements for wet granulation (WG) dry granulation(DG) and direct compression (DC) technologies. MEGGLE Excipients &Technology has upgraded its Application Service, first introduced in the early 1990s to provide comprehensive technical support for their extensive product portfolio. MEGGLE´s service provides the customer with expert assistance in making choices among a range of viable products. With this support the formulator will find the optimum choice on formulation and dosage forms. The service is particularly designed to assist formulation development scientists, R&D departments and purchasing managers. The Application Service can assist in resolving a range of detailed issues and challenges for all partners in the industry. The Application Service is based on MEGGLE’s own extensive expertise in developing innovative, functional products for application in new and existing dosage forms. Along with decades of experience as a leading pioneer in pharmaceutical excipient development MEGGLE is also an innovator in co-processed tableting excipients and direct compression. Experienced, well-trained and highly qualified application advisors around the world are there to serve different time zones, geographical locations and language requirements. Meggle has several independent application laboratories in Wasserburg, Germany; São Paulo, Brazil; Shanghai, China and Singapore. From these locations, the service provides multilingual assistance for the development of new markets, new segments, new application fields and business strategies. The MEGGLE Application Service plays a valuable role in helping customers with their know-how to define ideal applications. MEGGLE provides comprehensive technical specifications and information on the functionality of MEGGLE ingredients and excipients. MEGGLE’s overall philosophy is to provide customized solutions and service packages rather than just commodity products. Click on DirectCost to view the video. Click on Follow Meggle to access the LinkedIn profile. 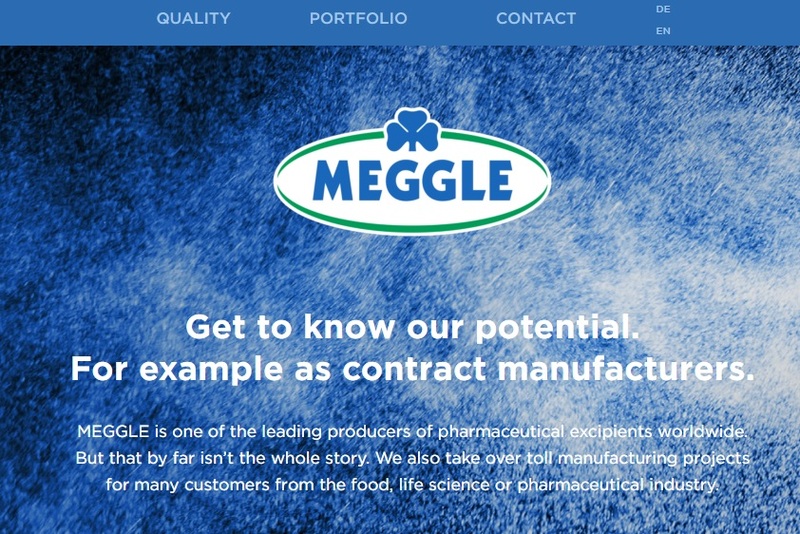 MEGGLE’s Excipients & Technology business division is not just one of the world’s most respected manufacturers of lactose-based pharmaceutical ingredients and excipients worldwide but can also provide contract manufacturing services for its clients from the food, life sciences and pharmaceutical industries. MEGGLE can take on projects involving spray drying, high shear agglomeration or evaporation. All facilities are state of the art to realize customers’ specific requirements, even highly unusual ones, to very high standards of quality, reliability and accuracy. 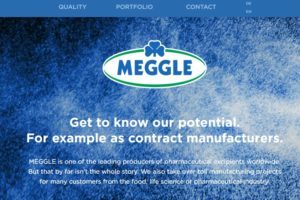 The MEGGLE contract manufacturing offer has been upgraded with new and more advanced facilities and is now supported by its own dedicated website. The modern MEGGLE facilities at Wasserburg include eight advanced spray dryers, five fluidized bed dryers and 10 Evaporators. Spray Drying Towers: Agglomeration can be achieved by various nozzle atomization of solutions, dispersions and emulsions at up to 200 bars pressure for enhanced product properties like improved powder characteristics, dispersibility and increased PSD. 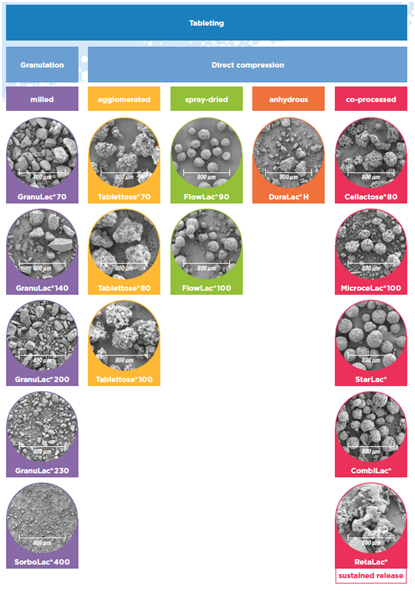 Spray drying capacity varied from 1500 to 3000 kilograms per hour – water evaporation. 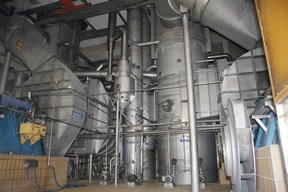 In addition one processing plant is equipped with a homogenizer unit applying up to 600 bars for various emulsions. Agglomerator: Using High-Shear-Granulator with subsequent fluidized bed drying, MEGGLE can greatly enhance product properties with improved powder characteristics, increased PSD, etc. MEGGLE’s agglomerators boast additional capabilities such as continuous mixing of up to three substances simultaneously. Evaporators: Falling-film evaporators with mechanical/thermal vapor recompression can withdraw water from product at up to 10.000 liters per hour, to achieve maximum concentration of product. All manufactured products can be packaged in paper sacks (15 – 25 kg) or in Big Bag for quantities of between 500 and 1000 kg. MEGGLE recognizes that customers must meet the highest possible standards concerning the quality of products in which the smallest errors in process design or implementation can have devastating consequences. To this end, all of MEGGLE’s facilities meet the strictest quality and regulatory requirements, including certifications according to ISO 9001:2015, ISO 14001:2004, FAMI-QS, HACCP, IPEC GMP, and EXCiPACT. MEGGLE can also provide full process or cleaning validation for pharmaceutical products in toll manufacturing. Click on MEGGLE Lohnfertigung for dedicated website. 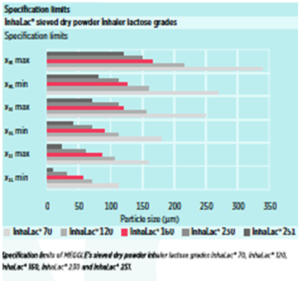 InhaLac® 500 is MEGGLE´s first micronized lactose grade that is specifically designed for dry powder inhalation. Developed by MEGGLE’s Wasserburg laboratories in Germany, this inhalation grade lactose exhibits extremely small particles. Combined with high quality and safety, this material will meet individual dry powder inhalation formulation requirements. Special benefit: Retest after one year! 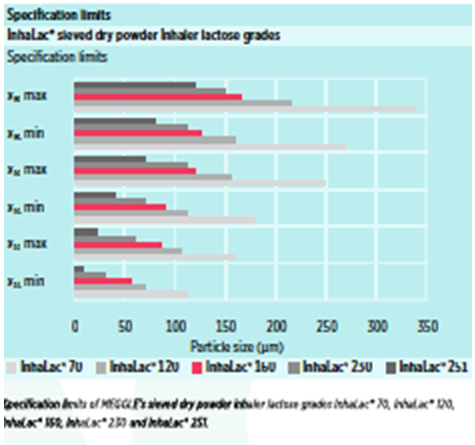 MEGGLE developed its specialty lactose grade, InhaLac® to meet the challenges associated with dry powder inhalation (DPI). Its highly controlled production process enables different high quality sieved and milled InhaLac® grades to be obtained, providing a range of particle sizes and making them behave as individual particles. Using lactose monohydrate as an excipient not only improves performance efficiency of the inhaler, but also facilitates powder handling during production. InhaLac® 500 features very small particle size with 90 % of the particles smaller than 10 µm, thus it exhibits a similar size as active pharmaceutical ingredients (APIs). This makes it very versatile across a wide range of applications. The micronized material features high cohesive properties and enhanced stability (retest after 12 months). 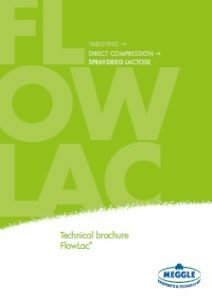 InhaLac® 500 is a micronized ultra fine lactose that is suitable for ternary DPI formulations . The addition of micronized fines improves the drug product performance. This can be related to several known effects, such as hygroscopic buffer effect or the saturation of high-energy active sites. Further, the high cohesiveness of the micronized material helps to alter the fluidization behavior of the powder blend and create agglomerates. 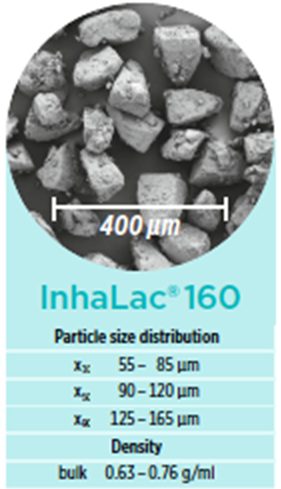 The micronized size with an x90 smaller than 10 µm makes InhaLac® 500 perfectly suitable for application in soft spherical pellet formulations. co-agglomeration with drug particles etc. 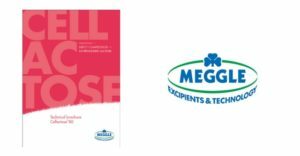 MEGGLE’s InhaLac® alpha-lactose monohydrate grades comply with the current harmonized Ph.Eur., USP-NF and JP monographs. All InhaLac® grades meet additional or stricter specification limits than those specified in current pharmacopoeias in order to meet the special requirements for pulmonary drug delivery. Additionally, MEGGLE is a member of IPEC (International Pharmaceutical Excipients Council. The pharma-dedicated MEGGLE production facility in Wasserburg, Germany is certified according to DIN ISO 9001:2008 and has implemented GMP according to the Joint IPEC-PQG Good Manufacturing Practices Guide for Pharmaceutical Excipients and USP General Information Chapter <1078>. MEGGLE invests considerably in raw material resource sustainability, production standards and efficiency and is actively engaged in environmental protection. Lactose meeting pharmaceutical standards is our first priority. Click on InhaLac 500 brochure for download.